The co-founder of Banasiak & Nettune Orthodontic Associates, Dr. Kenneth Banasiak, receives the top honor given to dental professionals by the local magazine for the ninth time. 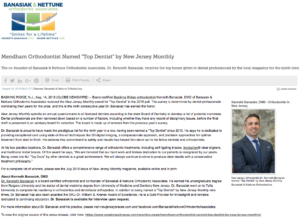 Basking Ridge, NJ — Board-certified Basking Ridge orthodontist Kenneth Banasiak, DMD of Banasiak & Nettune Orthodontic Associates received the New Jersey Monthly award for “Top Dentist” in the 2018 poll. The survey is determined by dental professionals nominating their peers for the prize, and this is the ninth consecutive year Dr. Banasiak has earned the honor. New Jersey Monthly submits an annual questionnaire to all licensed dentists according to the state Board of Dentistry to develop a list of potential nominees. Dental professionals are then narrowed down based on a number of factors, including whether they have any record of disciplinary issues, before the final draft is presented to an advisory board for selection. The board is made up of winners from the previous year’s survey. Dr. Banasiak is proud to have made the prestigious list for the ninth year in a row, having been named a “Top Dentist” since 2010. He says he is dedicated to providing exceptional care using state-of-the-art techniques like 3D digital imaging, a compassionate approach, and precision approaches for optimal treatment from start to finish. He believes this commitment to safety and results has helped him stand out to his fellow dentists and orthodontists. For a complete list of winners, please see the July 2018 issue of New Jersey Monthly magazine, available online and in print. Dr. Kenneth Banasiak is a board-certified orthodontist and co-founder of Banasiak & Nettune Orthodontic Associates. He earned his undergraduate degree from Rutgers University and his doctor of dental medicine degree from University of Medicine and Dentistry New Jersey. Dr. Banasiak went on to Tufts University to complete his residency in orthodontics and dentofacial orthopedics. In addition to being named a “Top Dentist” by New Jersey Monthly nine times, Dr. Banasiak has also been awarded the OKU Dr. William S. Kramer Award of Excellence. He is a Gold Provider for Invisalign® and remains dedicated to continuing education. Dr. Banasiak is available for interview upon request. For more information about Dr. Banasiak and his practice, please visit newjerseybraces.com and facebook.com/BanasiakNettuneOrthodonticAssociates.